The very essence of sport presupposes movement. A stadium – a theatre of sport – actually contains two performances which often occur simultaneously. There is the one on the field of play, and the responsive or reactive one from the audience – the spectators. We shall discuss how this dual performance or sporting ‘dance’ can be facilitated by the configuration of the stadium later. First we will look at the prologue – the very act of arrival and how this consideration effects the organisation and planning of the SWALEC Stadium. The first part of the stadium was developed in 1999 for the Cricket World Cup with the client Glamorgan County Cricket Club (GCCC). Cardiff was selected as home to the Australian team (tournament favourites) and the ground had benefited from the largest Sport Lot donation of £3.6M which had delivered a new National Indoor Cricket School, hospitality facilities, administration and 1,800 permanent fixed seats. The remaining 10,000 seats where all provided by temporary terraces. Cardiff hosted two World Cups that year (and still the only city in the world to do so in the same calendar year); both cricket and rugby. The city and the club were focused on making as much profile (and money) from both events. 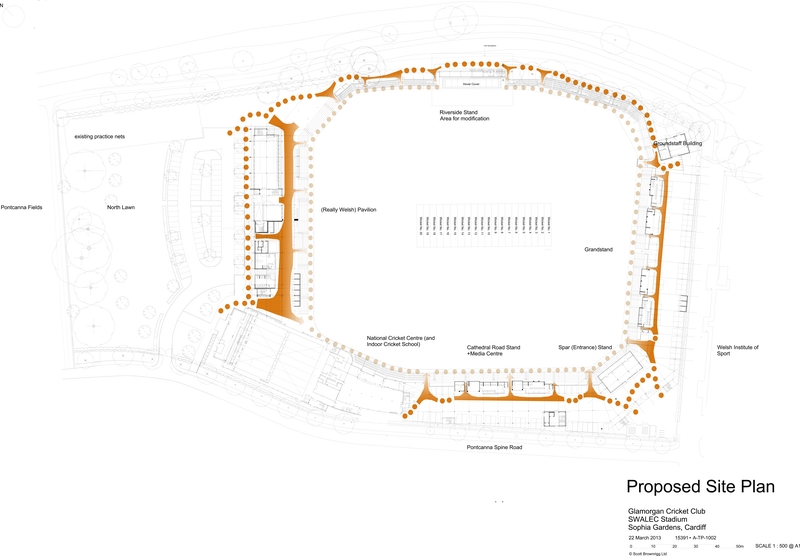 The placement and disposition of these first elements were conceived as part of a longer term masterplan which would enable the SWALEC to host future test cricket matches. The indoor school was very much conceived as ‘state of the art’ – it followed closely behind the indoor school at Lord’s (designed by Morley Associates) and provided a seven-lane fully netted hall which was also capable of holding functions for 750 people at a banquet. The rest of the ground floor was taken up by four changing rooms (designed to meet Sports Council Guidance for 22 players in each), a fitness suite, physiotherapy and medical facilities, offices and a club shop specialising in cricket goods and GCCC club merchandise. The upper levels provided coaching and viewing balconies, restaurant and dining, kitchens, GCCC offices and corporate hospitality. The roof above the hospitality block was designed as a huge roof terrace with great views over the square, covered by a tensile structure. Perhaps the biggest design consideration was to make the indoor school naturally lit. To play cricket at an international level, you need 1500 lux of light at the batting crease. Through the use of a saw-tooth roof which facilitated north light combined with a series of internal ‘sails’ to diffuse the light and avoid specular glare, this exacting criteria was achieved. The additional benefit was a 60% reduction in the club’s energy bills from their previous facility, as they were no longer reliant on huge quantities of artificial lighting. More romantically, the design included two huge aircraft hangar doors. These could open up the entire main hall to the square, bringing in air and the early spring smell of cut grass, to a functional space that is usually sweaty and introspective. 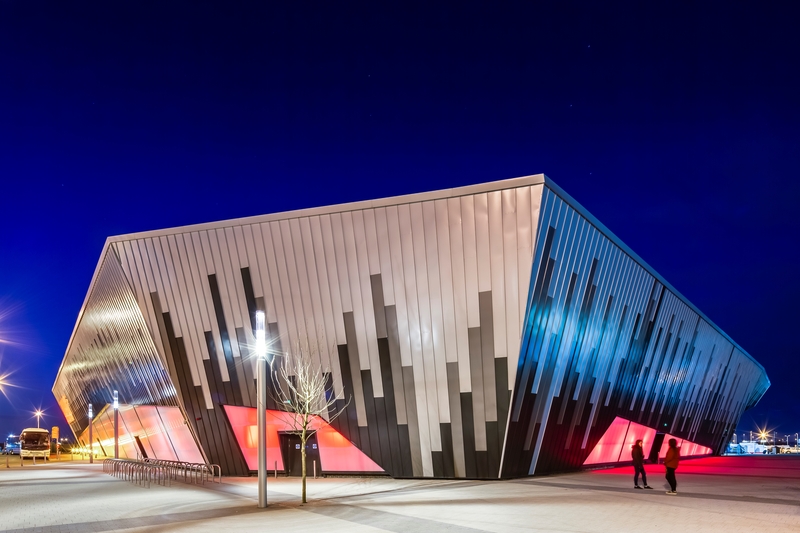 The structural system created to achieve this roof profile, was designed as an abstraction of the trees within the stadium’s unique Grade II listed park setting. From both outside-in and inside-out, the interplay of the natural and the abstraction is clearly legible through the clerestory light that separates the roof from the wall, creating a floating visual delicacy. However, as these elements were the first part of the overall development (because they were fundable and commercially viable) but were only smaller parts of the overall masterplan, these would shift the centre of gravity, albeit for a known period of time, away from the natural and designated points of entry and creating a diffused sense of arrival. The next phase of development enabled this imbalance to be addressed. GCCC and the city council had ambitious plans to host an Ashes Test – that historic cricketing battle between England and Australia. To do this, the stadium had to meet the essential criteria set down by the England and Wales Cricket Board (ECB) and the Test Match Status This included requirements such as 15,000 permanent seats of which 10% had to be covered, a media centre to facilitate 200 press members, TV and Radio studios, outside broadcasting facilities, test officials accommodation (Third umpire, TV replay etc) and ancillary accommodation. This quantum of development enabled the overall masterplan to be completed. 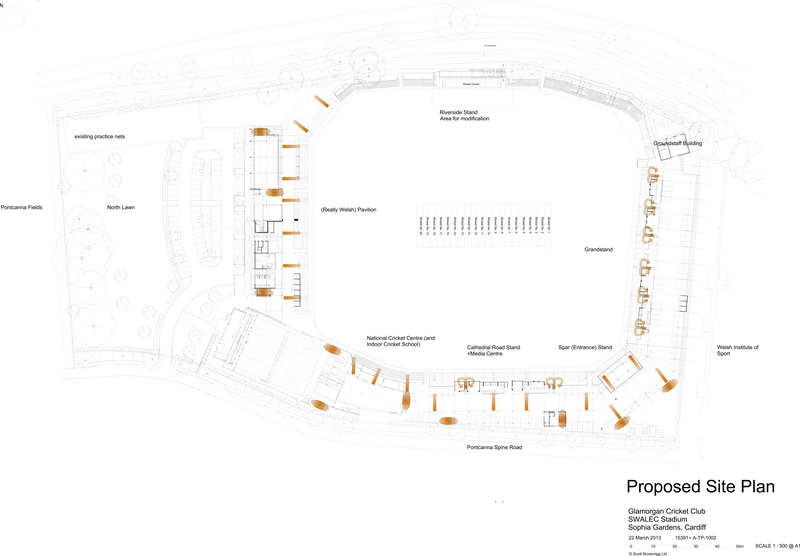 A new members and players pavilion, the media centre and two new grandstands were created– placing main entrances that would address the public realm. The vision even included a new waterbus station on the River Taff – allowing spectators to arrive by boat from hotels in Cardiff Bay. The complete sequence of arrival through the Grade II listed parks of Bute Gardens, Sophia Gardens and Pontcanna Fields would be an important part of the spectator experience – the commencement of the performance. 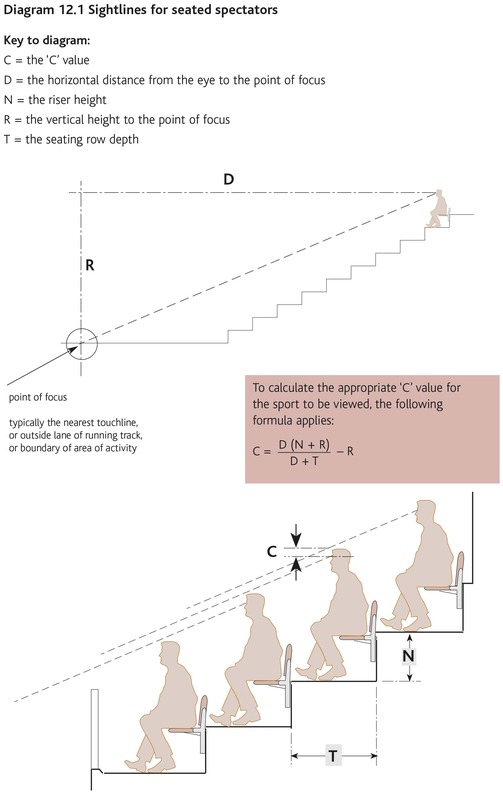 So we use linear spaces for movement and static spaces for of moments of rest – the gathering of the crowds and the accentuation of excitement and expectancy. The connection between the landscape context and the configuration and concept was fundamental. 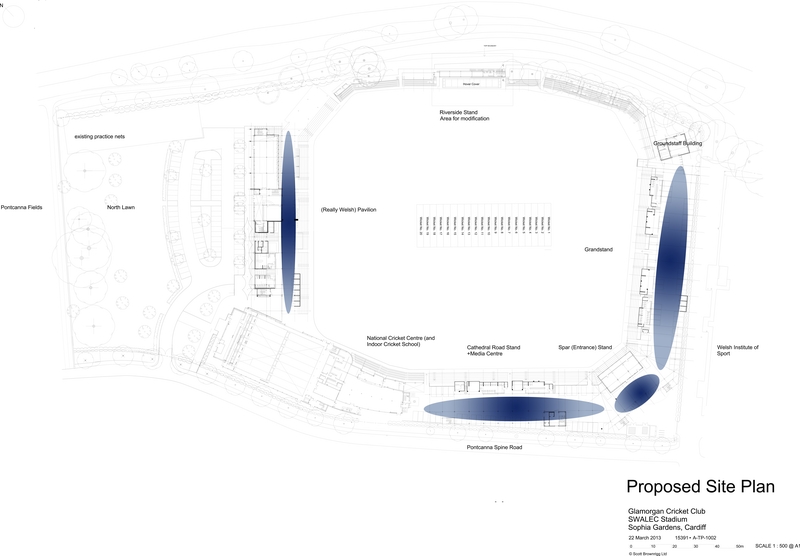 Therefore, rather than being a complete stadium ‘bowl’ – typical for contemporary cricket facilities particularly in the southern hemisphere – the SWALEC is a series of pavilions joined by a skirt of seating, with higher grandstands that accentuate or hide parts of the ground. This castellated profile allows the parkland landscape in and a viewed prospect out. Whilst there are obvious similarities in some design principles across all sporting stadia, the general use of a cricket stadium has some fundamental differences from its football or rugby cousins. The Safety at Sports Grounds Act 1975 (commonly known as the Green Guide) is the bible of design principles that govern specific requirements for a large number of the elements that constitute the stadium. It is applicable to grounds that have a capacity of 10,000 seated spectators or over. The first major difference is that in most cricket matches (Twenty20 games excluded) are longer and have natural break periods (bowling change of ends, fall of a wicket etc) and often 45 minutes for lunch. Even the bish-bash of the Twenty20 games has some of these breaks. This takes away the crowd rush and pressure on ancillary facilities (particularly toilets) in the 15 minute half time break for football and rugby. Equally because of the length of the game, spectator arrival is more relaxed and casual, although this has a different effect on movement around the stadium which we explain later. The second major difference is viewing time. A Twenty20 game lasts for around three hours which is the shortest format, but normally a day’s cricket is 6-7 hours. The consequence of this is that seats and seat spacing (including terrace goings) are more generous. There is no necessity for crowd segregation either, which has a significant effect on spectator movement (although the SWALEC has been designed to accommodate spectator segregation). Get these wrong, and you have the unpleasant consequences such as those that have troubled the new London City stadium (previously the Olympic Stadium) as West Ham’s new ground has seen sadly evidenced in its early use. The drama of arrival is an important part of designed movement flows. It is generally considered that to arrive at an upper level and then migrate downwards, reveals the pitch or the sporting theatre in a way in which enhances that arrival experience. 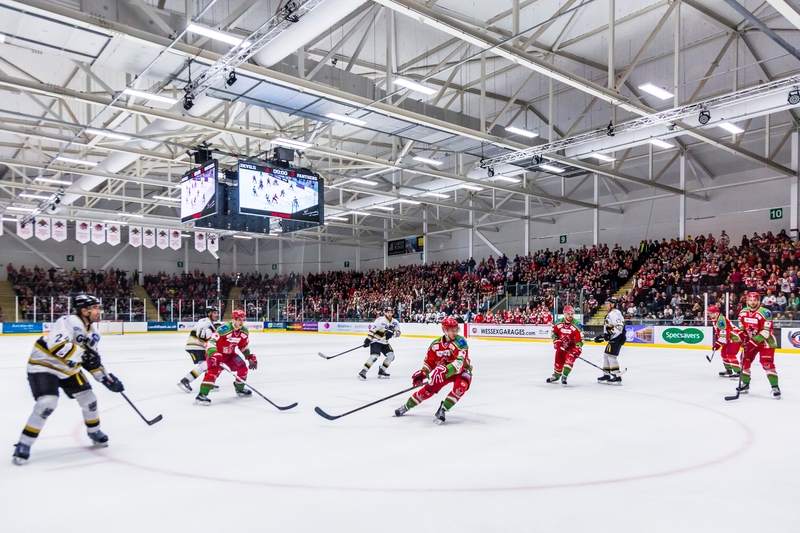 Unfortunately, the budgets at both the SWALEC and Ice Arena Wales (IAW) allowed this movement pattern – there was no natural topography that facilitated this particular sequence, even though the IAW was conceived as having a first floor arrival, this was sadly “value engineered” out. However, within the two main stands at the SWALEC, this arrival sequence was manufactured by the use of vomitories. These stair devices lead you up from the ground floor concourse from where the oval is still hidden. The flight takes you up half a level at which point you cross the threshold from the enclosed space of the concourse to the open bowl of the oval. This transition is a key aspect of that sense of arrival – that sense of theatre. There is an ebb and flow between when the crowd inspires the players and when the players inspire the crowd. This is facilitated by several things – acoustic properties are important, but good sight lines and an unobstructed view of the action, combined with a terraced section that provides those good sight lines but with physical intimacy to the playing area, are perhaps even more significant. Here, the Green Guide again provides useful design criteria for establishing a good spectator experience. The measurement is called the ‘C’ value and is calculated by using the diagram shown.